Now recognized for Excellence in Wellbeing by Great Place to Work®, Synergy Vision is launching its first Senior Development Programme this month, designed to catapult mid-level managers to senior positions as the company continues to expand. 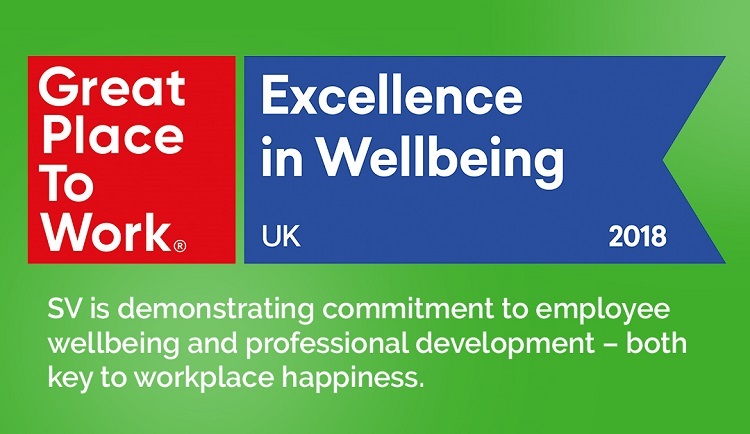 Excellence in Wellbeing is awarded by the globally-recognized Great Place to Work® Institute to companies meeting rigorous criteria around work environment and employee financial security, mental and physical health, interpersonal relationships, work-life balance and fulfilment. Great Place to Work® applies data and insights from around 10,000 organizations globally to benchmark individual companies’ performance. SV's new Senior Development Programme augments the personal development plans already embedded in our culture. It will roll out through 2019, with six mid-level managers enjoying tailored, blended learning to hone their management and leadership skills. The programme will include 360° review and feedback, self-led and directed skills development and mentoring. The managers will also begin to mentor others through a link-up with the 2019 Graduate Development Programme. SV’s team-focused ethos seeks to promote a positive work-life balance and excellence in delivering for clients. In December 2018, SV launched a 4-day working week without reducing pay, an initiative thought to be the first of its kind in the UK healthcare communications sector. Training and development opportunities for employees mean that our people feel fulfilled professionally, which translates to outstanding service for clients. Efforts such as these are why SV has been recognized by the Great Place to Work® Institute for 3 years running.